Fan-filmed video footage of the new lineup of QUIET RIOT performing at the Rock The Arena II festival on March 25 at the Savage Arena in Toledo, Ohio can be seen below. 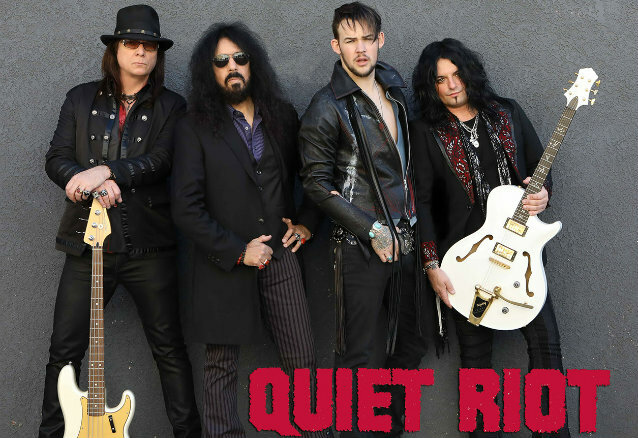 QUIET RIOT made its live debut with the band's seventh lead singer, "American Idol" finalist James Durbin, on March 18 at The Cotillion in Wichita, Kansas. Durbin, who became known as the "metal guy" on 2011's season of "American Idol" after performing "Living After Midnight" and "Breaking The Law" with JUDAS PRIEST, joined QUIET RIOT earlier in the month after the dismissal of Seann Nicols (a.k.a. Sheldon Tarsha; formerly of ADLER'S APPETITE). Nicols was with QUIET RIOT for just a few months, but long enough to record the vocals for an early version the band's upcoming album, "Road Rage". Prior to the Wichita show, Durbin — who recently collaborated with QUIET RIOT guitarist Alex Grossi on the "Maps To The Hollywood Scars" EP — explained his decision to join QUIET RIOT, saying that it was partly motivated by his desire to elevate the band's status to levels not seen in the decade following original singer Kevin DuBrow's death. "Me stepping into QUIET RIOT is me wanting to use the attention that I have and the things that I have done to highlight a band that I feel is being forgotten, or is being remembered for the wrong reasons," he said. "[The QUIET RIOT documentary 'Well Now You're Here, There's No Way Back' is] a great movie, it's a great story, it's tragic, it happens to every band. Whenever somebody loses a member, you go through this thing where you're trying to find somebody to fill that spot, and in some cases, it's just another guy, but in other cases, it's your best friend or your brother. And you've really gotta find people that you really gel with and really work with and really understand." He added: "Even though I know Alex for the past four months, and two days of rehearsal — the only two times I've ever been in a room together with [QUIET RIOT drummer] Frankie [Banali] and Chuck [Wright, QUIET RIOT bassist] and Alex all together — I feel like we know each other already. I feel like I've known Frankie for years. And so it's this natural progression where I come in, I know the material, I'm prepared. I had two weeks to learn the sixteen-song set — more than other people that have had much longer time. And I come in, and I know it, and I'm happy to be there, I'm grateful to be there, I'm happy to be working with people that wanna work and love to play music. "For me, the whole 'Idol' thing and everything all together, the reason I did was just so that I could be a working musician and play music for a living and support my family. And that's who I'm in a band with. So it's pretty cool. It's come full circle. But nothing in this music industry or the rock and roll world or anything comes without a price to pay, so whatever the ticket price is, I'll pay it. But you can guaran-damn-tee that I will be there every single night banging my head, making you feel the noise, and I will never phone it in, dial it in, make a gimmick of myself or this band, because they deserve it, Kevin DuBrow's legacy and memory deserves it, and QUIET RIOT deserves it." QUIET RIOT announced earlier in the month that it would delay the release of "Road Rage" until this summer so that Durbin could replace all the vocals on the album with new lyrics and melodies. Banali revived QUIET RIOT in 2010, three years after DuBrow's death, along with Grossi and Wright. The group went through two vocalists — Mark Huff and Scott Vokoun — before settling on Jizzy Pearl in 2013. Pearl announced his exit from QUIET RIOT last October.